I said I was going to video tape the roost and by GOD I did. I am a woman of my word. 8 or so Martins visiting on the housing. Seems like small family groups. I have noticed that the fledglings seem to enter the compartments whereas the adults will only peer in. I took down the barn and gave it a quick cleaning. I will give it a more intensive cleaning perhaps tomorrow. It was pretty thick with filth. Ah, the things we do for love. Last night I FINALLY made it to the premigratory roost in Davie Florida. I had the privilege of meeting Bryant Roberts, a knowledgeable and very nice gentleman who has made it his duty to monitor this roost site. He has done a fine service to birders and Purple Martin fans by bringing attention to this site. He has made it a thing for the town of Davie to be proud of. Unfortunately, I was about a week or so too late. I believe that our severe afternoon weather may have hastened the departure of the Martins. Mr. Roberts informed me that this year there was an estimate of over 10,000 birds and last night he estimated only about 500-600. Of course I did get to see those 600 or so martins swoop and circle like a funnel cloud, then disappear into the trees that they roost in. That was a beautiful sight. Like one large living breathing thing. I can only dream of what a site it would be to behold the roosts in Louisiana or Texas. On a business note, I just received inventory of some fine Purple Martin Polymer Jewelry pieces. The Jewelry is made out of a ‘polymer’ or plastic clay that is baked to a hard ceramic-like form. I just had to buy myself one of the pendants. I’ll tell my husband that it is a consolation prize for ‘him’ making me miss my martins. tee hee! June 27, 2008 It’s OVER! My season is over! My babies are gone! What ever will I do!?!?! They all fledged. Mommy didn’t even bring them home last night to sleep. I will have my husband keep a close eye out to see if she brings them home tonight. I HOPE to go to Davie, but we will see. No rain in today’s forecast. There were about 8 martins visiting on and off for only minutes at a time. They have become quite neurotic in that they fly off at the slightest noise and appear nervous. Perhaps its just their wanderlust kicking in. The itch to migrate must be getting stronger. I uploaded the last of the baby pics to the photogallery. I will miss them all. All 65 babies. At least its nice to know I am more than half way to my goal of fledging 100 birds in a season. Today the babies have definitely fledged. The took up a temporary residence on top of the same tall pine that the Swallow-Tailed kite gets his snacks from. (I have seen the Kite predate a nest a couple of times in that tree) All the visiting martins were going to the tree to lend moral support. Several weeks ago I posted a request for prayers for rain. Well. it worked. Now I just want an afternoon break to see the roost. The article from the Sun-Sentinal came out today and they mentioned my blog. Pretty cool. I posted the link for the article over on the right. Hope any new visitors like what you read. While you all enjoy reading my blog I hope you check out some of my links. The link for the photo-gallery has lots of pictures of my martins. SO, for any not familiar with what a Purple Martin looks like, check out www.mypurplemartinblog.com/gallery2 I will shortly be adding the last photos I took of the nestlings. On the last nest check I got a few pics of the babies in my hands. Such a humbling experience. My last 3 babies of 2008. Such a quiet trio. You wouldn’t even know they were there. I often go out under the housing to see if I can see their beaks peeking out. The gourd they are in faces out towards the yard, away from the house, so it is hard to see whats going on. I listen and can sometimes hear them chirp only when momma martin is nearby. Sometimes I see the gourd shake slightly as they beat their wings frantically doing their pre-flight warm ups preparing them for flight. I am unsure as to how many remain in the gourd. I thought perhaps one had fledged but I can not be positive. I can not risk bringing the house down to check, as they are too close to fledging. The numbers continue to decrease. Only 15 or so martins at a maximum. The weather has NOT been cooperative. I keep talking about visiting the Davie roost but have yet to hear when the weather will break. June 20, 2008 Feedback Wanted! I have been putting some thought into what this BLOG will cover during the “off” season. Some of my ideas are to cover a new Purple Martin topic every few days. Such as Starlings, sparrows, history of the martins and more. Sort of like a Purple Martin magazine or book in installments. Its an idea. If you have any topic ideas please let me know. I know a lot of purple martin landlords are having problems this year with parasites and drought, so perhaps even BLOG entries on those issues. Our weather has been very unstable. Beautiful in the AM hours then developing into violent thunderstorms with high winds in the late afternoon. Due to this I have been unable to visit the premigratory roost as yet. I am waiting for a favorable weather report to plan an outing to Davie as the roost is active for a few more weeks only. On a Purplemartins-r-us update; I have been considering several ideas. 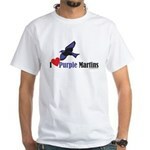 One idea is changing our name to PurpleMartinArt vs PurpleMartins-R-us. It is a domain name I already own and would not disrupte or change the site in any way. Another idea is offering a limited selection on Swallow art and collectibles. Since Purple Martins ARE a type of swallow…Let me know what you think. I love hearing from all of you. My 3 remaining nestlings are still in the nest and the mother is calling to them trying to lure them out. Feedings seem to have decreased. But then again, since there are only 3 in that nest and most of the other nests had 5 nestlings, I may be used to seeing them feed more often due to there being more mouths to feed. There is an abundance of dragonflies around. The visitors are still around daily during AM hours. Very quiet in the PM though. I only see the female and I have NOT seen her enter the gourd to sleep. She may be sleeping with the other martins at a nearby assembly site. I am starting to think that for the titles on my blog, I should go for something more descriptive and eloquent than just the date…something like “6/17/08 The lonely mother” Sounds so much more dramatic! NO, Not me. I’m not lonely. Are you kidding. My kids are so far up my kiester… It’s the last female martin momma that is still feeding her babies. It seems like she is alone most of the time. Her male was here yesterday. I did not see him today at all. She has become very protective, even dive-bombing me on the pool deck. Either that or she really, really likes me! She is definitely ready for these babies to fledge. She spends alot of time away from the nest. Gone for hours at a time. But then she shows up with the babies chirping wildly. They know its her from a mile away. It is so quiet. Only a short time of low activity this AM. Maybe 15 birds or so. I told my husband that I will be going to the roost on Friday. Got to see it. WOW, Purple Martins are clearing out of the area in a mass exodus. From one day to the next the number of visiting martins is dropping like crazy. 2 days ago there were anywhere from 30 to well over 50 martins at any one time. These were passing martins and they did not stay for any long period of time but there were tons of martins pretty much all morning from sunrise till about 1 PM. Today there were, at max, 15 martins at any given time. There would be periods of no activity (except for the feeding parents) for an hour at a time. I can’t wait till this weekend to drive to Davie for the roost!